FATHERHOOD Please pray for the men involved with the women we serve to value the importance of fatherhood. Pray for our Heavenly Father to provide strong, godly mentors for these dads to encourage them to commit themselves to the success and wellbeing of their children. BOLDLY SPEAK UP As more individuals connect with the ministry of CPC, pray for God to continue moving their hearts. Pray for our supporters to inspire a grassroots effort of bold affirmation for LIFE across South Hampton Roads – within individual churches, families, workplaces and neighborhoods. May the Holy Spirit guide tongues and squelch fear in order to bring glory to LIFE! Thank you so much for the excitement and energy that you brought to the Walk for Life events just a few weeks ago. Throughout the entire Walk season, we felt God's hand moving all over Hampton Roads as people were fundraising and getting others involved in CPC's Walk for Life. Thank you for all you've done - we are so grateful you chose to join us and we appreciate your faithful support for CPC's Walk for Life! God was honored, LIFE was lifted up and ministry funds were raised. The funds raised in CPC's Walk for Life help provide valuable services and resources needed to show the love of Christ to women and families. 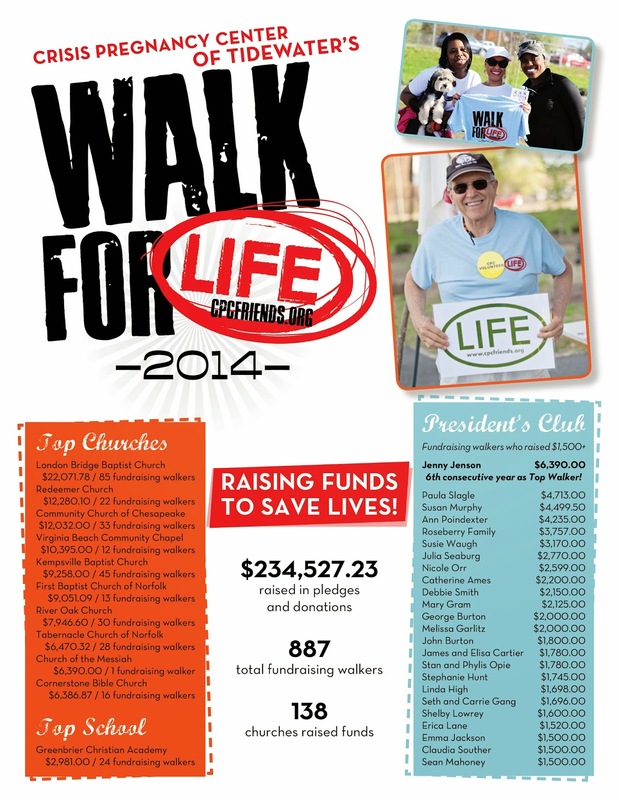 To date, a total of 887 fundraising walkers joined together to raise more than $234,000 in pledges and donations. This support enables the Lord's work to continue as we seek to impact more lives in 2014! See Top Walkers, Top Churches and more HERE! It may not have been their initial intention, but Alva and Susan Yoder have created a legacy of LIFE. When the ministry of CPC was still getting started in the 1980s, Susan gave of her time by cleaning offices and even brought her oldest son with her to help stuff envelopes during bulk mailings. In time, the Yoders became LIFEkeepers – committing monthly financial support to help women and babies when they need it most. Aside from their church, Crisis Pregnancy Center of Tidewater is the one ministry where Alva and Susan feel 100% confident donating. And this confidence stretches beyond their immediate family unit. As the Yoder’s seven children have been getting married, Susan is most happy to see her adult children and their extended families embrace LIFE, forming a new generation of families who are supporting CPC with their time as volunteers and with their finances as LIFEkeepers. 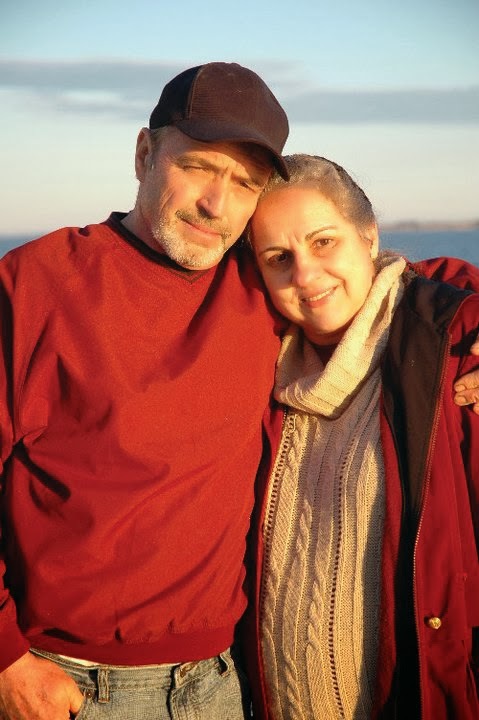 Join the Yoders – become a LIFEkeeper today at iamalifekeeper.org. 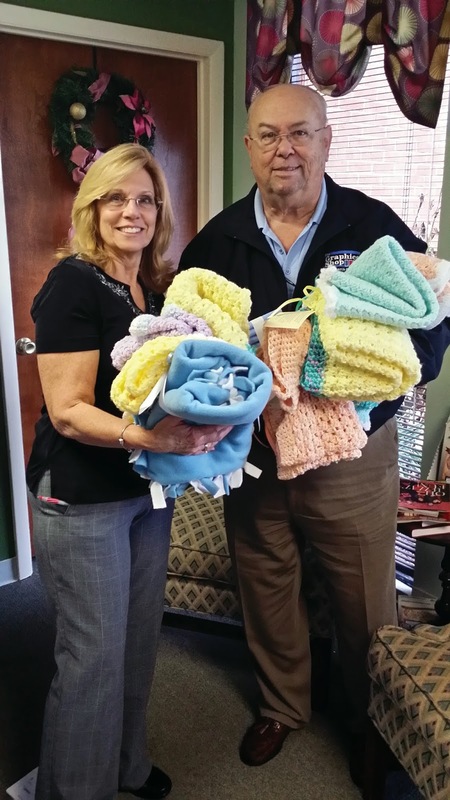 Charlie Hackworth, Sr. (pictured with CPC’s Debbie Smith), a long time friend of this ministry with his family business Hackworth Documents & Technology, has been making special deliveries. Years ago, Charlie’s sister, Becky Gower, lost her son Christopher to muscular dystrophy. As she sought a way to honor her son’s memory, she began handcrafting beautiful baby blankets for moms and babies supported through CPC, praying for the recipients with every stitch. 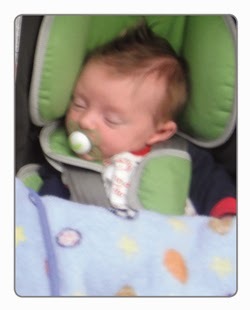 Each blanket is pinned with a note and a Bible, letting the new moms know they are loved and lifted up to the Lord. Learn more about CPC's additional ministry needs at http://cpcfriends.org/ourneeds.